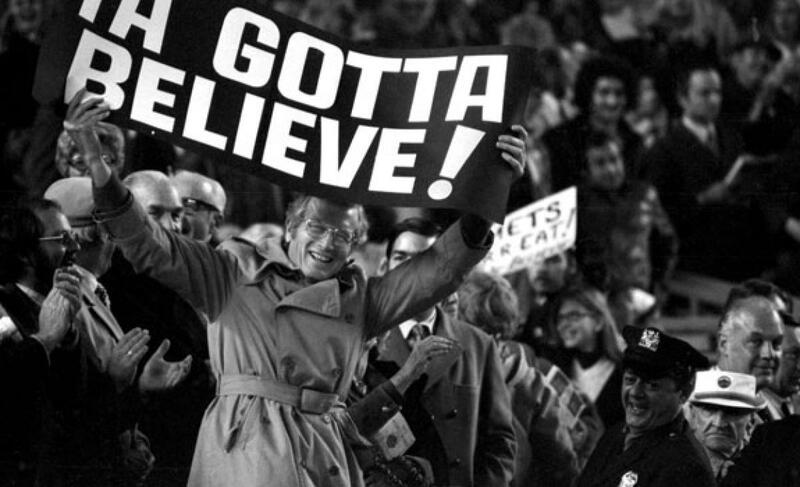 Game 1 Recap: Nationals 3, Mets 1; Bats quiet behind dominant Syndergaard | We Gotta Believe! The Mets (89-71) fell to the Nationals (82-78) by a score of 3-1. Gio Gonzalez and Noah Syndergaard posted zeros through 6 innings each, but Noah Syndergaard gave up a solo home run to Clint Robinson to lead off the 7th. The Mets tied it, but lost on a 2-run home run by Bryce Harper against Addison Reed. With this loss, the Mets fall 1 game behind the Dodgers in their quest for home field advantage. The Mets need to win both of their games combined with a Dodgers loss, or win 1 of their games combined with 2 Dodgers losses in order to get home field advantage. (This may be a good time to read Jared Diamond’s article for the Wall Street Journal, dispelling home field advantage.) According to the TV broadcast, it is the first time the Mets have lost 4 straight since mid-June. The Mets had a few chances against Gio Gonzalez, but most of them were not of their own doing. Gonzalez, as he did in his last start against the Mets, was a bit wild at times but still effective, throwing 6 shutout innings while allowing 3 hits, 3 walks, and striking out 7. All 3 of Gonzalez’s walks came in the 3rd inning, but the Mets were not able to convert, partially due to an acrobatic catch made by Matt den Dekker in right field against Daniel Murphy. Syndergaard was dominant again today, allowing only 2 hits over 7 innings while walking 1 and striking out 10. Unfortunately, 1 of those 2 hits was a home run to Clint Robinson. In the bottom of the 7th inning, the Mets came right back to tie the game against Blake Treinen, after a Lucas Duda walk, a Ruben Tejada single, and an RBI single by Juan Lagares against lefty Matt Grace. However, in the top of the 8th, Addison Reed walked Anthony Rendon with 1 out, and got Yunel Escobar to hit a sharp ground ball right at Daniel Murphy. Murphy knocked the ball down but couldn’t field it cleanly, and got the out at 2nd before an errant throw by Ruben Tejada kept the inning going. Bryce Harper followed with a long 2-run home run to give the Nationals a 3-1 lead, which Casey Janssen and Felipe Rivero were able to hold. Game 2 between these two teams starts at 7:10, with Max Scherzer facing off against Matt Harvey. POSITIVES: Noah Syndergaard had all of his pitches working tonight, and it certainly looks like he’ll be able to put up a solid fight against Clayton Kershaw or Zack Greinke in game 2 of the NLDS. Jon Niese pitched an eventful but clean 9th inning, allowing a hit and a walk to the two lefties he faced. However, Clint Robinson was thrown out by Yoenis Cespedes trying to stretch his leadoff single into a double, and Niese picked off Matt den Dekker trying to steal 2nd. Travis d’Arnaud was not where he needs to be, but he absolutely crushed a ball in the 2nd inning off Gonzalez, but the wind held it in the park and d’Arnaud settled for a double. Juan Lagares came through with a key hit at a key moment. NEGATIVES: Daniel Murphy and Ruben Tejada should have been able to turn that double play in the 8th inning, and the failure to do so led to the 2-run home run by Harper. Addison Reed was the one who allowed the home run, making that his first two runs allowed as a Met. Michael Cuddyer was unable to convert with a couple of key moments at the plate. The offense in general looks tired, and even if the Mets open the NLDS in Los Angeles, it probably will be good for the team to get 4 straight days off. *Much of Murphy’s -.103 is undeserved, as he hit a liner that appeared to be over the head of right fielder Matt den Dekker in the 3rd inning. However, den Dekker made an acrobatic catch to save at least 1 run. That play was worth -.049 WPA. That being said, Murphy and Tejada’s mistakes in the 8th inning may have cost the Mets the ballgame, but WPA does not take defense into account.